At a time when southern California residents are asked to ration their water usage due to prolonged drought, Nestlé is taking vast quantities of water from the area for its Arrowhead brand of bottled water. As the Desert Sun reports, no one is really sure how much water Nestlé is taking. The company operates on reservation lands in the Cabazon basin owned by the Morongo band of Mission Indians and are therefore exempt from the local water agency’s oversight and reporting requirements. Although the numbers have not been independently verified, the Morongo report 601 acre-feet of water diverted or pumped from Millard Canyon in 2013 – about 200 million gallons, or enough to supply 400 typical homes in the area. For the water agency and the parched local communities, the bottling operation is understandably a cause for concern. Nestlé’s extraction of water despite potentially threatening ecological conditions highlights a hallmark of the culture of capitalism. For whatever economic benefits the capitalist culture may bestow, like other cultures it has its own set of values and beliefs regarding the natural world. In his classic study of the Dust Bowl, Donald Worster summed up those values thusly: First, “Nature must be seen as capital.” Second, “Man has a right, even an obligation, to use this capital for constant self-advancement.” Third, “The social order should permit and encourage this increase of personal wealth.” In other words, as Worster went on to say, “The community exists to help individuals get ahead and to absorb the environmental costs” of such pursuits. These maxims constitute the internal logic of capitalism as it relates to the natural world. The consequences of that logic, however, do not play out equally everywhere. Place matters. The ecological conditions in one geographic area may absorb some the harshness of such imperatives. Elsewhere, where ecological conditions are less forgiving, acting according to these maxims results in brutal consequences for individuals and communities. The West – that geographic area of the nation extending west of the 98th meridian, where average annual rainfall is below 20 inches – is exactly the kind of landscape where the ecological circumstances are less forgiving. It is a “marginal landscape,” meaning that it is an environment not particularly favorable to permanent human settlement, and such settlement is only maintained at great effort and is always tenuous. 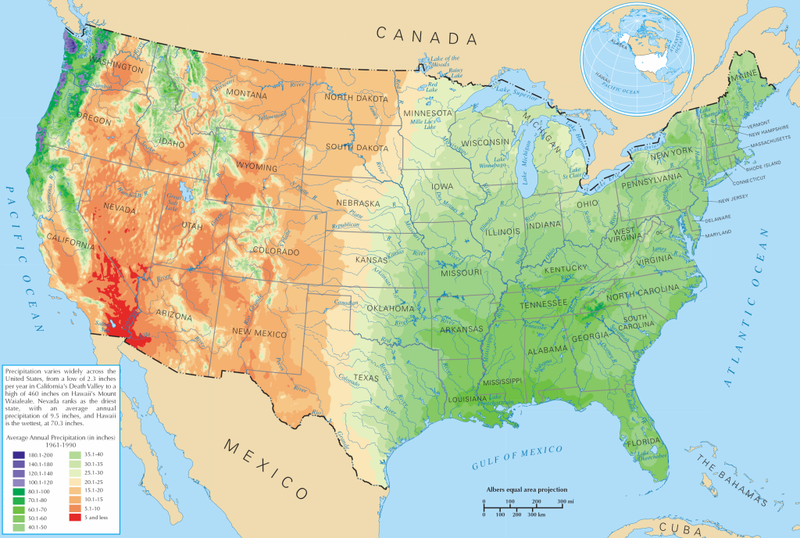 Look at a precipitation map of the United States and it becomes apparent that the West is categorically a different place than the rest of the country with a different set of environmental realities with which to contend. For two centuries American pioneers had been working out a technique for the utilization of the humid regions east of the Mississippi River. They had found solutions for their problems and were conquering the frontier at a steadily accelerating rate. Then in the early nineteenth century they crossed the Mississippi and came out on the Great Plains, an environment with which they had had no experience. The result was a complete though temporary breakdown of the machinery and ways of pioneering. Part of Worster’s argument in Dust Bowl was that the culture of capitalism, with its inherent set of values relating to the natural world, ultimately led to catastrophe when those values were applied to the marginal landscapes of the West. In response to a war ravaged Europe clamoring grain, increasing numbers of farmers (encouraged by grain speculators) plowed up the Great Plains at a rapacious pace in order to plant wheat. When the pendulum of alternating decades of drought and rain swung back toward extreme aridity in the late 1920s and 1930s, the wheat withered and died. The soil, once clothed by hardy native grasses, then lay bare and exposed to the blistering winds of the open lands. The result was the Dust Bowl, a disaster that destroyed lives and livelihoods, uprooted families and communities, traumatized a generation, and wreaked havoc on the nation’s agricultural economy. Nestlé’s bottling operation in the Cabazon basin, while far from the scale of the Dust Bowl, is but one more example in the long history of the West where the pursuits of industries bent on ever expansive profits apply a logic ill-suited to a marginal landscape. Like other incidents in that long history, the corporation operates within a culture that sees nature as merely an instrument for further monetary gain – burdening the community at large with the ecological costs of that pursuit. This entry was posted in Bottled Water, Capitalism, Environment, Environmental History, History, the West and tagged bottled water, California, Donald Worster, Dust Bowl, Nestle, property rights, The Great Plains, Walter Prescott Webb, water on July 21, 2014 by Duncan.